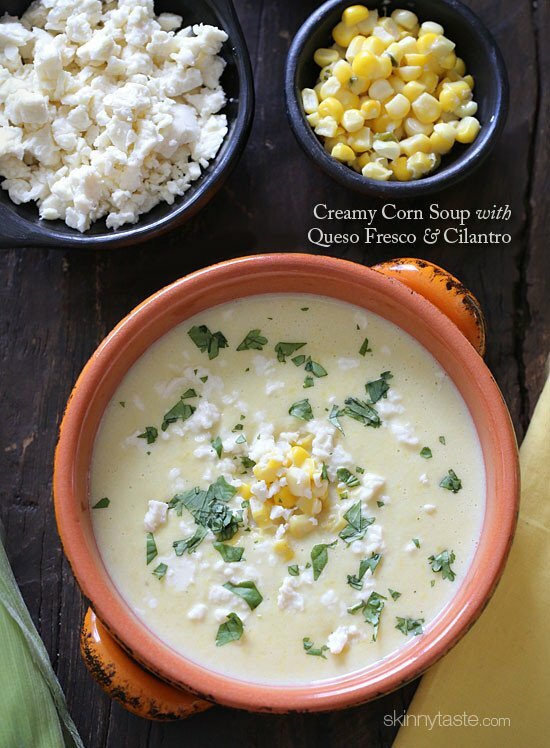 A comforting creamy corn soup made with fresh sweet summer corn, low fat milk, thickened with a potato and topped with crumbled queso fresco and fresh cilantro. I love this soup, and this is the perfect time of year to make it with summer corn at it’s sweetest! The temperatures we were having last week were in the high nineties and soup was the last thing on my mind. But finally we are back in the eighties, and a bowl of soup is always comforting to me. 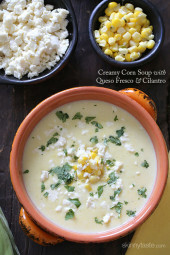 Inspired from a Colombian soup called Crema De Mazorca from the Andean region of Colombia, this soup is sweet and creamy, made with fresh summer corn. I didn’t use any cream, instead it’s simmered in low fat milk and thickened with a potato, once pureed it’s thick and velvety. Then I finished it with some crumbled queso fresco and fresh cilantro with gives it that sweet-savory finish that we love in my home! If you can’t find queso fresco in your area, try another salty cheese like cotija, ricotta salata or a mild feta. Sure, you could probably make this from frozen corn, but I don’t think it would taste nearly as good so for best results, make this with fresh corn while it’s in season. This is a great meatless soup, perfect for vegetarians and it also happens to be gluten free! Heat a medium heavy pot or Dutch oven on medium heat. Add oil and sauté scallions and garlic for 1 minute. Add the corn, potatoes, milk, bouillon, and 1 tablespoon of cilantro in a large pot and bring to a boil. Reduce heat to medium-low, cover and simmer for approximately 30 to 35 minutes or until the corn is tender, stirring occasionally. Remove from heat and reserve 6 tablespoons of the corn kernels for topping. Add sour cream to the soup and purée in the blender in two batches, careful not to burn yourself; return to the pot. 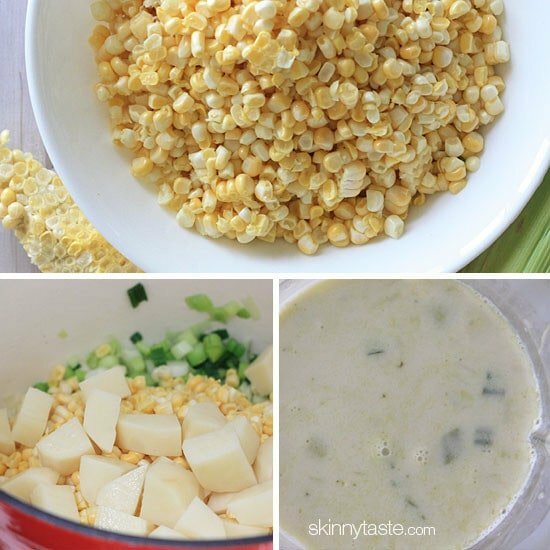 Pour into 6 bowls and garnish each bowl with 1 tablespoon each of corn kernels and cheese. Can’t eat any dairy, but will try this with cashew milk which tastes nearly like skim milk. Will have to omit the cheese on top unless you have any suggestions? Can this be made in the instapot? Like a throw and go kind? With two toddlers that’s all the time I get! Would love your suggestion on how to do it. Thanks! Hi Gina! I made this corn soup as per the recipe. Mine wasn’t thick however, it was yummy! I had to use corn starch to thicken it. I used a large russet ( a bit larger than 6 oz). I’ll definitely make this again but I’ll use less milk. I used fresh corn as you suggested. FANTASTIC!!!! Seconds and thirds were served! NO LEFTOVERS! Question:How about substituting milk for coconut millk for another type of corn chowder? This really was splendid! I followed recipe to the key and it was very flavorful! Husband who is a total carnivore approved of this meatless meal! Yum! And our vegan 3yr old was in heaven! This is so yummy! I think it would also be great with some spicy boiled shrimp added to make corn and shrimp soup. I added sirachi, cumin and chili powder for taste. Could this be made in a pressure cooker? If so, how long or just push the soup button? I tried that, I wouldn’t recommend it. The texture of the corn and potatoes came out perfectly, but the milk developed a brown skin that I had to pick out of the soup. It’s just too hot to bring a pot to boil, in my kitchen, today. I will be sauteing the oil, garlic and onion, first in my IP, and then adding the rest of the ingredients, as listed through step 4. Then, I will use the preset soup button, and do a quick release. Step 5 has you reserving out 6 tablespoons of corn kernels. I will do that, then proceed with step 6, but I will just use my stick blender, to blend everything. After that, I will just follow the rest of the instructions from there. I have to watch my salt intake. Do you have a suggested substitution for the bouillon cube? Made this soup last night and it was great. Recently became vegetarian and I am excited to find meals that my whole family likes. My 17 year old son went back for seconds! Next time I will add a little extra corn and potatoes so I can reserve more chunks for texture. I also will probably add a jalapeno or poblano for a little kick. Anyone tried adding a pepper? I was craving a warm soup in the dead of winter and decided to try this one. Frozen corn worked just fine and was delicious. After reading the reviews that it was a bit bland, I added 1/2 teaspoon of cayenne pepper (as my fiance and I love spice) and 2 cubes of chicken boullion instead of one and it was fantastic. Can;t wait to try with fresh corn in the summer months!! Can I use immersion blender and blend all at once? Thank you! I used cooked corn that I had left over. BONUS: the skin of the kernels ‘hulled’ themselves during cooking and I was able to skim them off. Family members with digestive and IBD issues were able to enjoy the wonderful taste of fresh corn again! Thank you!! Do you think I could make this with soy milk? Would this reheat in a crockpot well for a food day? I have a question on the fat is that saturated fat or the normal fat? You’ve done it once again! Amazing! Made this yesterday with some farmer’s market corn…oh yum! I added 3 slices of thick-cut bacon which was a nice addition. I drained most of the fat, and just used a little bit to saute the aromatics. I had a big container of fat free half and half, so I used 4 cups of that and 1 cup of fat-free milk for my liquid. That gave it a little more creaminess (which compensated for the fact that I was out of sour cream so had to skip that!). I also put in some extra potatoes so it would have more of a chowder-like texture. 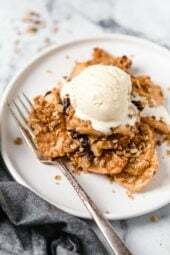 I pureed just about 2 cups and left the rest chunky, and it was great. I think next time I will add some rotisserie chicken. 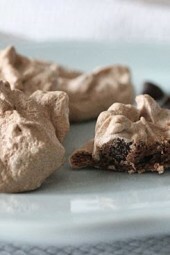 This is a great basic low-fat recipe that you can build on to your preference. And it definitely needs the fresh sweet corn! Does anybody know whether this soup would freeze well? Yes, it should freeze OK. Thank you for your reply!!! Such a huge fan of Skinnytaste!!! Happy Thanksgiving. One of my favorite recipes of yours!! Your soups are always amazing. Very tasty! Used sea salt & pepper (approx 1 tsp each) and cotija cheese (salty as it is). Was great. Made this with canned corn since December isn't the best time to find fresh and with whole milk — loved it! This came out delicious! Sweet and yummy! I used an immersion blender instead of dealing with the mess of pouring it into a blender, and it came out smooth and tasty. I recommend doing it this way– and there's less chance of burning yourself on hot soup. This looks delish! I think I would add a bit of fresh jalapeno to the mix to give it an extra kick! I loved this soup!! It had the sweetness of the corn and the saltiness of the Cotija cheese. And it was even better warmed up the following night! I made this for dinner last night and it was absolutely delish! Thank you so much for the wonderful recipes and amazing website! Just made this for the first time. I didn't care for it as much just after I'd made it, but I placed leftovers in the fridge. I took some out a little while ago and out of curiosity tried it cold… BAM! That change in temperature just seemed to do it for me. I was excited to try this because it's the season for Colorado Olathe Sweet Corn (yum!!!). I made it as instructed (except for the reserved corn, please consider putting that in the recipe to add all corn except for reserving 6 tbsp for garnish) and it was really good. It didn't blow me away but it was a good solid recipe that I would make again. Both of us thought that the Queso Fresco really didn't add anything to it so we'll probably leave it off next time. Something crunchy on the top would be good too but I'm not quite sure what. I'm loooking forward to trying it after it has had a chance to sit like mentioned in other posts. I just made this for dinner tonight and it was delicious!! Definitely recommend. Hey the soup was awesome. I would just reserve a little more corn kernels from the soup to make it more chunky. My grocery store didn't have the cheese you suggested. I put cheddar and it tasted great! This was sadly underwhelming for me… I felt like it didn't have a lot of flavor to it and it turns out that queso fresco is extremely bland (almost no taste at all). I'd probably do it with goat cheese next time, something to give it a stronger flavor. Most of the taste came from the salt and pepper. Very easy to make though. I just made this tonight and it was delicious!! I decided to leave about 1/4 of the soup out of the blender because I like some veggie chunks and it worked out well. I also added 2 chopped carrots for some added nutrition. I made a total mess cutting the corn off the cobs but the end result was worth it! Perfect soup to dip some crusty bread in…. I cant wait to eat leftovers all week! What do you think about freezing this soup for future lunches? Wondering if milk and sour cream would make this a bad idea. Very delicious! I think I might cut the milk down a bit to make it a little thicker and I'd love to add some shrimp or crab to get a little more protein in there. Definitely a keeper of a recipe to tinker with! YUM! I love it now and am looking forward to see how the flavors develop overnight. 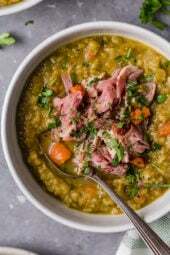 I had 6 ears of organic corn in my CSA today and could not have found a better place for it than in this soup (ok, except for the one I ate raw standing over the sink). Might add a celery stalk for the simmer next time and take it out before pureeing (another great flavor add from your recipes). Only change – used 2% milk b/c it is what I usually keep in the fridge. Wow! I just made this tonight, and it was very good. The only thing that I did differently was add the salt to the corn and potatoes when they were cooking to give it some flavor! I will try this again before the end of the season! Thanks again Gina! I made this delicious soup last night. I omitted the cilantro (I didn't have any on hand) and used sharp cheddar in place of queso fresco for the same reason. It is sooooo good. Creamy and so tasty. I added just a bit of salt and pepper and didn't think it was too bland. I think I enjoyed the taste of the fresh corn so much I wasn't thinking about seasoning!! I may saute shredded zucchini next time to bulk it up for very few calories. This is a winner…will make again. I don't have veg bouillon, but do have veg stock. Can I use as a substitute, and if so do I cut back on the milk or add to it? Or, I saw on the internet a substitute for veg bouillion that sauteed onions and garlic and some spices. What do you think? This was delicious! Although the comment suggesting starting with 1 tablespoon of salt was WAY off to me. I like foods that aren't salted that much, so maybe that's why, but I probably could have done with about 1/4 as much. I ended up adding a bunch more milk and it was still too salty to me. Not inedible or anything, just saltier than I would have liked. I love all of Gina's recipes, but this was a tad bland. I did two things that helped – as weberash said letting it sit works wonders and it needs generous seasoning. For me plain salt wasn't enough. I happened to have a mix with garlic and onion powders, salt, pepper, and chives. I had to use a full tbsp. Next time I think I will cook a few strips of bacon, pour off most of the fat, sautee the scallions and garlic in the remaining and add the chopped bacon back in. If not going vegetarian it really doesn't add a ton of points over the whole chowder but would add a lot of flavor. So delicious! My husband thought I had lost my mind and that it was packed with calories! Best corn soup he's ever had! Me too! We made this last night for dinner was delicious! Fresh corn is definitely the way to go it was nice and sweet! We didn't need salt, I added a pinch just cause but otherwise didn't add anymore. We used almond milk since that's what we have in the house and it still came out good. Yes, it has to be fresh, or it won't be sweet! Glad you liked it!! Stupid question…do you cook the corn prior to cutting off the cob or does it cook in the soup? 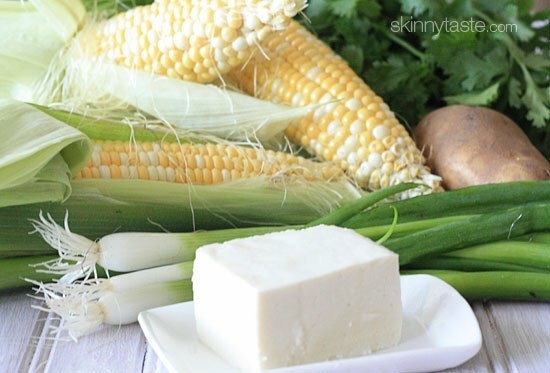 A great way to use all of the fresh corn at the farmer's market! The consistency (after puréeing in the Vitamix) was beautiful. For those of you who may be equally baffled by the omnipresent "salt to taste" instructions, you'll need a tablespoon of sea salt as a decent starting point. Corn needs salt, period, and one tablespoon spread out among six bowls is not bad at all. A second tip: be patient when it comes to serving this soup. I ate it right away because I was starving, and don't get me wrong, it was good, but not mind-blowing. Well, when I went to put away the leftovers over an hour later, I took another taste. Sweet sassy molassy, the stuff was TWICE as good! It just needed another hour to sit and let all the flavors blend. I will be keeping this recipe. Is there another herb to substitute for cilantro? Or just omit? Use some chives, would be perfect. Same question I was going to ask; I'm not fond of cilantro. Thanks for the chives suggestion! I use parsley or chives, as I hate cilantro with every fiber of my being. My husband is allergic to potatoes (worst allergy EVERY! ), and I did not know if there was something I could substitute for the potatoes so we could still enjoy this soup. I did not know how well cauliflower might stand up in it. Any suggestions would be greatly appreciated! It might work, not sure if it would effect the taste but why not! I wondered about the cauliflower, too. I would think the texture would work fine. Mmmmmm! I'm also a huge fan of corn soup, and I can't wait to try your version! The queso fresco is a brilliant addition! As always – fantastic recipe, beautiful photos … another winner, Gina! Thanks! Made this for dinner tonight! Loved it! We had made fajitas over the weekend so we had all the indgredients. Thanks! Is there any reason I couldn't make this a chilled soup? Queso fresco sounds like (I had to wiki it) the cheese my mom's family brings for us from Honduras :). They just call it queso (cheese) though but I wonder if I can find 'queso fresco' in our local supermarket and find out if its the same thing or something very similar. There is queso fresco in every supermarket. It's usually by the cheeses in the refrigerator. Like the sliced cheeses and cheese sticks, ect. Any suggestions on what to sub for the chicken bouillon if you want to make it vegetarian? I love Better than Boullion vegetable base. Comes in a jar near the boullion. Can this work with frozen corn? Cutting corn off the cob is a pain. Sure, but I don't think it would taste as good. a hint for cutting corn off the cob. Place a small bowl upside down inside a larger bowl or pot. Place the corn cob end on the overturned bowl. Cut off the corn and it will fall into the bowl and not get all over your counter. When you are finished all of the cobs, remove the small bowl and you have a bowl full of fresh corn kernels that you can divide for this recipe and others or freeze as needed for recipes this fall or winter when fresh, in season, and cheap corn on the cob isn't available. Is it possible to substitute the 1% milk with almond milk..? Slightly better for ya. Don't know how it would taste since it's supposed to be made with cream.